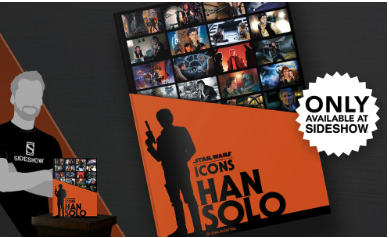 New from SideShow, and an exclusive only available at SideShow, the new Star Wars Icons: Han Solo. This is a hardcover book by Insight Editions and can be found here, where you can pre-order your copy today. Per the SideShow website, it should ship anytime from November to December of this year. Perfect holiday gift for your most loved Star Wars fan. music for the Los Angeles Times, the Hollywood Reporter, and Entertainment Weekly.